Sign up for the Bunches waiting list here. I’m building Bunches, the best way to come together. You all probably know that I love hacking/coding/etc., and I recently wanted to build something with Firebase. When not at my day job (CEO of Exeq), I built a little chat app for myself and Miranda to communicate. I call it Bunches. I’m currently building Bunches as a side project: my family and I were using Slack to communicate, and it’s obvious that it wasn’t built for our use case. Additionally, apps like Facebook Groups and GroupMe are clunky and frankly not delightful to use. Sure, there are family-oriented apps out there (Picniic, etc), but I wanted to build something a bit more general-purpose. Text messaging or WhatsApp is fine if all you want to do is chat, but we all know that groups interact in more ways than just chat. We plan events, we pay one another back after outings, we make decisions, we share media, and more. I’m building Bunches to be that place for small groups to communicate. Because Bunches is starting out as a side project for myself, I’m building it just for iOS right now, but plan on building an Android app and web app if there’s enough interest. I’ve got a number of things I want to bring to the app on top of the existing chat functionality, and if you’re an early tester, you’ll get a link to the planned roadmap and upcoming feature list….along with the ability to vote on what you’d like to see! Want to help? Sign up for the waiting list here. Posted byDerek Brown April 2, 2019 Posted inTechLeave a comment on I’m building Bunches. Philadelphia Bans Cashless Stores: In another episode of claim chowder, the first blow in the coming cashless war has been dealt. I’ve long said that I don’t know how long “going cashless” will be legal, though I was a little wrong here: I figured the federal government would be the first to intervene. Philadelphia claims it’s a social inclusion issue, which I buy (but there are actually technology solutions that can solve that problem). The real issue with stores going cashless in my mind is at the federal level: it can devalue USD and renders circulation moot. This will be a very interesting storyline to follow over the next decade. Especially as plastic becomes more expensive for retailers. Cameras, apps: Noosh to showcase the future of restaurant tech: This is one of those things to file in the “creepy but cool” category. I mean the internet access points are whatever (seriously, if you’re going to a restaurant because of their internet bandwidth, WTF are you doing with your life? ), but the integration of technology into the experience is something to watch. I think the AR piece is a marketing gimmick for now, but there will be a breakout application in AR commerce over the next 5-10 years. Don’t believe me? Snapchat NYC Metro Card AR: Came across this on the interwebs this past week. Pretty cool implementation of Snap’s AR lenses. Download it here (you need an MTA card). Star Wars: A New Hope Infographic: This thing is huge and very cool. Wish there was a horizontal version (print it out, put it on a wall). How Chinese Novelists Are Reimagining Science Fiction: I wish the title of this article were a bit different (they’re not reimagining SF, they’re contributing to it from a different worldview than the typical Western author). In any case, I’ve fallen in love with Chinese SF. I recently picked up another Ken Liu anthology (the newly released Broken Stars), and one of the best things I’ve read this decade is Cixin Liu’s Remembrance of Earth’s Past series. Game of Thrones Season 8 Trailer: It’s here. Finally here. If you just want to get to it and see my reading list, click here. If you want to sign-up for Notion, feel free to use my referral link here. Mobile and desktop accessible. I read everywhere. At the coffeeshop, on a plane, in my office, at work, in the bath. I need my reading list where I read, which means everywhere. If I don’t have access to my reading list, then as I’ll certainly forget to update it regularly, which means a nightmare of organization later whenever I get to it. I want a queue system. I not only want to track what I have finished reading, but what I am currently reading, and what I will be reading. Quick entry of new books to add to the queue. In the same way that I want to be able to update my reading progress, I need to be able to add books to the list in real-time as well. You never know when you’ll receive a recommendation from a friend or colleague, when you see a cover in an airport, or when a book you’re reading makes another recommendation. I want to jot those down immediately so I don’t forget them…plus it means I’ll never run out of books to read. Sortability and filtering. I try to be diverse in my reading, which means tracking how much of which genre/author/etc. I’m reading. I also want to see which books I own and which books I should pick up the next time I wander into my local bookstore. Quantifiable tracking. In addition to just having a straight-up list of books that I’ve read, am reading, or want to read, I also want to be able to quantify a few things: how long does it take me to read? How many books have I read? How long does it take me to get to a book once I’ve heard about it? Things like this matter to me so I can hold myself accountable for my reading: I want to feel guilty when I have been pouring time & attention into TV, social media, or video games rather than reading. 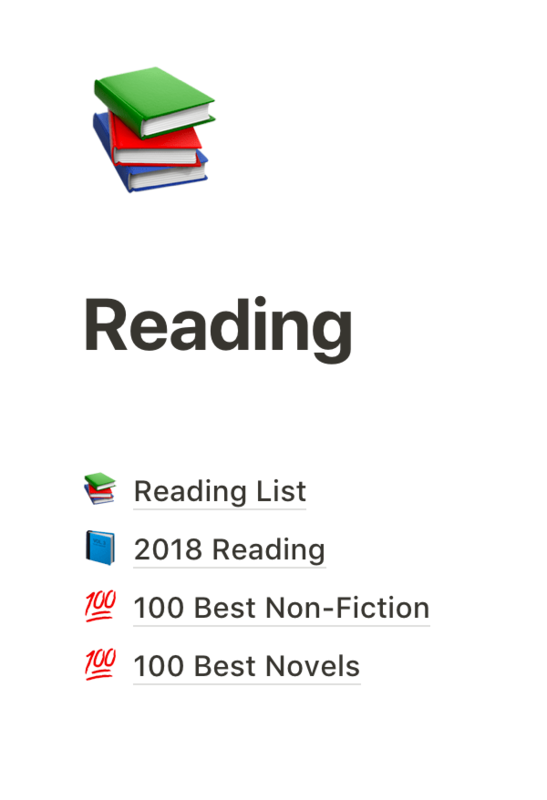 I don’t like Goodreads, and not just because of the Amazon affiliation: it’s just a pretty bad interface to keep track of a lot of reading, in my opinion. I’ve also tried a number of off-the-shelf (ha!) solutions that just haven’t worked for me, so I decided to roll my own. Over a year ago, I switched from Evernote to Notion for keeping my life together (travel plans, side hustle ideas, etc. ), and it was a logical place for my reading list to live. Utilizing Notion immediately solves for the mobile/desktop requirement, and my implementation of the reading list also solves for the rest. There are a couple of things I’d really love that would make it perfect, but this is definitely the best solution for me out of everything I’ve tried thus far. 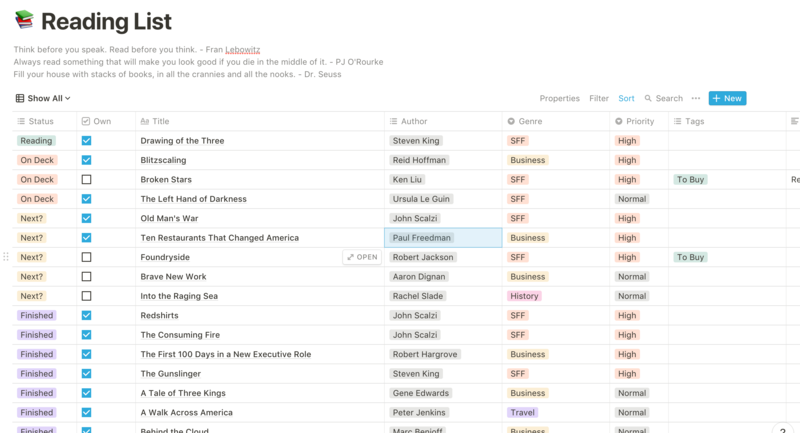 In this post, I’ll walk you through how I’ve setup my reading list using Notion. You’ll find a couple screenshots along with descriptions for how I’ve implemented the table. Various lists I have in Notion. The primary is Reading List. Reading: What I’m currently reading. Usually, only one book falls into this status, but occasionally a second will slip-in. On-Deck: These are the books that I want to read after I’m done with what I’m currently reading. It lessens the mental load of picking what’s next as soon as I’m done with a book. I don’t have to comb through my shelves or backlog to figure it out: I’ve already done it. Next? : These are the books that I’d think about reading next (and moving into the On Deck status). It’s the real queue out of all the books on the list. Finished: Once I’m done with a book, it moves to this coveted status. At the end of the year, I move all books with a Finished status to their own table (ie, “2019 Reading”). Own: This is a checkbox column, and simply indicates whether I actually own a book or not. I prefer to own every book I read, and I buy books from local bookstores (McNally Jackson, Greenlight, Strand are some favorites here in NYC). Title: Self-explanatory, hopefully. This is a text column. 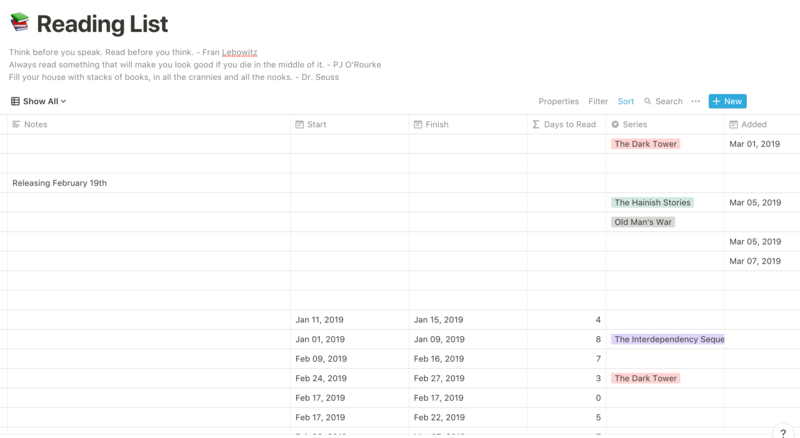 Author: This is a multi-select column, with each author as it’s own value, set to the default color (although Notion’s current implementation of default coloring is a poor design/product decision…or just a bug). This allows me to easily sort the table or filter by a specific author. Priority: This is a column I’m testing out. It’s a select column with Urgent, High, and Normal values, and I use it to further decide what to read or purchase next. To Buy: This is a super useful tag when I’m standing in a bookstore, and have no idea off the top of my head of which books to pick-up. I filter down to the “To Buy” tag, and see if they’re in stock. Easy! Classic: I want to track which books are considered “Classic” by some standard, and I utilize a tag to do that (for example, Hemingway’s Old Man & The Sea or Asimov’s Foundation). Notes: Random text holder (usually something quirky about the book or a release date). Start: A date in Notion, which indicates the date on which I started reading the book. Finish: The counterpart to Start, which indicates the date which I finished reading the book. In the summary on this column, I count the number of non-null cells, which gives me a total count of books read year to date. Days to Read: A formula in Notion, which calculates the difference between Finish and Start, giving me the number of days that it took me to read the book. In the summary on this column, I calculate the average days to read, which helps me keep pace for my desired book count in a year. Added: This is a fairly new column, which I…ahem…added this year. It’s a date column that helps me track when I added a book to the list. Eventually, I’ll probably track the time it takes for me to get to a book, once I’ve added it to the list. Total Books on the List: 220 right now. Read So Far in 2019: 10 books. Average Days to Read: 4.8 days per book. Hope this helps those of you looking to track your own reading in a serious way! I’ve found Notion to be a great tool for this (among other things), though I definitely have a couple of gripes with them about some of the minor details. Feel free to check out the list yourself at the link above, and feel free to sign-up for a free plan at Notion using my link above as well. If you have any questions or comments, feel free to comment! The Drawing of the Three by Steven King: I recently picked up and devoured The Dark Tower from King, a book that’s been on my list since high school. Well worth the wait, and I’m stoked to sink my teeth into the second book. The Left Hand of Darkness by Ursula LeGuin: Ursula is legendary in SF/F circles, but I’ve yet to read one of her novels. I have this one and The Dispossessed in the queue right now, so I’ll at least start the Hainish stories. If they’re as good as people say, then I bet I pick up her entire body of work. Shameless by Nadia Bolz-Weber: Nadia isn’t from my “brand of Christianity”, but I love what she had to say about grace, the Church, and Jesus in her previous book, Pastrix. I haven’t gotten to read Accidental Saints yet, but this tome on sexuality in the Kingdom of God is at the very least going to be an interesting read. Blitzscaling by Reid Hoffman: This one doesn’t need an introduction. I’ve read parts of it prior, and obviously watched the videos, read the Medium notes from the class, and lived in the Hoffman-created world at LinkedIn. I’m sure this one will be a book that I mark-up. Ten Restaurants That Changed America by Paul Freeman: For those that know me, you know I’m a huge foodie, and in love with the hospitality industry. In another life, I would’ve gone to culinary school and opened a restaurant. Who knows what the future holds? In any case, this history lesson should be a good read, though it’s a bit thicker than I expected! What do you think? Any of these sound interesting to you? What are you reading this week? Pete Buttigieg on Pod Save America: For those of you not following my Twitter, you may not know that Mayor Pete is someone I’m paying close attention to in the Democratic primary. I don’t agree with all of his policies, in fact I’m to the right of most of his platform items, but if you know me at all, you may know I don’t vote based on policy or party lines. I look for leadership capabilities, summarized in the three I’s: intuition, intelligence, integrity. At a glance, Mayor Pete has them in spades. Will be interesting to see how he rises in the national conversation. So far, strategically, he’s making the right moves: seeing him a lot more in the press and he’s been touring the battleground states of NH and IA, along with the more populated states like CA and NY. Take a look at the video above (a recording of a podcast interview) for a good look at how he thinks. Aligning Business Models to Market: What a great read about not just the hospitality/commerce industry, but a look at the dynamics of looking at your business model as an extension of the market you’re in, even down to resources that are available to you. One of the most interesting things is seeing the “farm system” analogy extended to hospitality, as it’s one that I’ve utilized in my technology career (and even written about before!). Maggie Rogers & Florence Welch on “Light On”: Are you kidding? These two women on stage together is incredible. Miranda and I had the pleasure of seeing Florence in the flesh at Barclay Center a while back, and I look forward to seeing Maggie as well. What a couple of phenomenal voices, and performers. Pearls of Elixir: For the nerds following this blog, I’m an Elixir-fanatic. This is a pretty interesting look at some snippets from the more popular packages in the space, where the author zeroes in on some educational patterns utilized. I learned a couple of nifty tricks; maybe you will as well. Bryce to Philly: I’m a Nats fan. And an Eagles fan. I think I’m OK with this, but not quite sure yet. Revolut’s Destructive Culture: People act like cultures like this are abnormal and anomalies (see: Uber, etc. ), but the reality is that it’s almost standard in the industry. While I fortunately haven’t been in environments quite like those reported on, personal and family health is rarely at the top of anyone’s list in Silicon Valley. It’s nothing new, and really isn’t new even with the technology industry or American capitalism. As long as market advantages are to be had, there will be work cultures like this. Plastic Gets Costlier: This report from the WSJ is both sad and very intriguing. I recently had a conversation with a restauranteur who only accepted AmEx because of the fees that Visa and Mastercard were already charging. Will be very interesting to see how the economy (and small business owners in particular) react to this increase in fees. What an interesting time to be working on payments! Hint, hint. How NYC Became a Tech Town: When I first moved to NYC, I got a lot of questions about how the NYC tech scene compared to SF and the Valley. My response was always that technology was the first space in which NYC had really been an underdog, but that I saw the NYC tech space catching up in 5 years. Seems like it took half that time.